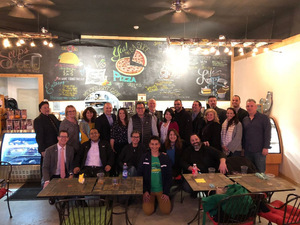 The Brewster-Carmel Chapter of Master Networks invites you to attend their April 11 Mixer at Moonlight Café 850 Route 22 in Brewster from 6-9pm. Join us for a night of trivia, networking, drink specials, cash value prizes, SWAG giveaways, and raffles. The event is open to the public. Master Networks is a network of learning-based, community-minded entrepreneurs and business leaders. This event will be a fundraiser for the Cultural Arts Coalition’s efforts to restore the Old Town Hall Theater, which is located at 67 Main Street in Brewster, NY. Chapter Secretary and Cultural Arts Coalition Board Member Margaret Carey and her husband, Peter will be guest bartenders and will be donating their tips and any funds raised that evening to the Old Town Hall Theater restoration. For more information about the theater visit www.CulturalArtsCo.com and for more information about Master Networks visit www.MasterNetworksNYCT.com. Moonlight Cafe is a "relaxed food joint" with a newly opened bar. Owner Neal Hirsch will be running the Moonlight Café’s popular trivia night beginning at 7:30pm. There is no admission fee. Moonlight Café will have a variety of food & beverages available for purchase including vegan options, desserts, wine, beer, kombucha & nitro coffee. All are welcome! Don't miss the fun, get a team together and come put your knowledge to the test.